With winter here, now is the time to do all you can to reduce your energy bills! Read on for eight great tips on how to save on heating costs this winter from sealing up cracks to making your water heater more efficient. Your heat source is the biggest user of energy in your home during the winter. It only makes sense that your system should run as efficiently as possible. Having the heating system serviced and changing the filter regularly will ensure the system is operating as efficiently and inexpensively as possible. 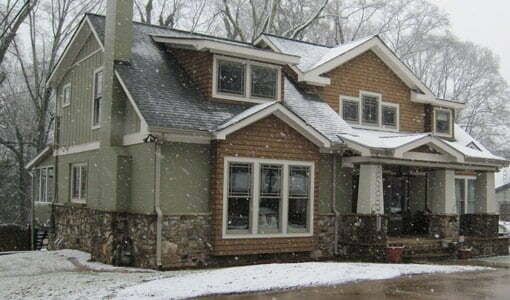 Every degree you lower the temperature in your home will save 2% to 3% on your total heating bill. You can adjust the temperature on your thermostat manually or install a programmable thermostat to do it automatically. Reverse ceiling fans so they turn clockwise and run on low to circulate the warmer air that rises to the upper areas of your rooms. Recycling this air will make your rooms more comfortable. Your water heater works 24 hours a day to provide you with hot water when needed. Lowering the temperature setting on your hot water heater will make it run less, saving you money. Hot water pipes that are not insulated allow hot water to lose heat as soon as it leaves the water heater. Insulating these lines with readily available foam pipe wrap will decrease the cost of heating hot water. Almost every attic could use more insulation. Your attic should have at least 12″ of insulation in warm climates and 16″ in cold areas. Plastic encapsulated fiberglass insulation batts make installing additional insulation itch free and are safer for do-it-yourselfers. Small cracks around windows, hose bibs and doors allow cold air to infiltrate the home causing a more expensive effort to keep temperatures comfortable within the home. Sealing these cracks with exterior caulk or foam will make it easier and cheaper to heat your home this winter. Also, make sure weatherstripping around windows and doors provides a good seal, and replace if needed. If new, insulated windows are not in your budget, consider applying an inexpensive window insulation kit. This kit contains double stick tape and a thin plastic film that when installed on the interior of your window, creates an air cushion to block cold air. My door that leads to the outside has been slammed so many times in the past 30 years that there is now a huge gap between door frame and the wall! I’ve hammered and tried different ways to fix this problem with no success. Can you please help me? Teresa from Linden, Tn. Gina or anyone who knows the answer. Do they have other means of adhering to the window frame as my frames are not metal. I went total electric in my home a couple of years ago. I am concern about the my electric furnace because last year with the snow and ice, I had a few problems with my furnace. What can I do to protect my electric furnace from the snow and ice? Can I cover it with some type of insulation? The Better Homes & Gardens exterior facelift winning home used Woodscapes solid color stain with Sherwin Williams custom mixed colors. You can find detailed information for all of the Better Homes & Gardens contest winners in the resources section in the back of the September 2009 issue. Programming a digital thermostat (instead of using it just like the old manual round-shaped ones) can create significant savings while minimizing discomfort. By reducing heating or A/C demand while you are out of the house or asleep, you can save up to 30% on associated costs. And as stated here, setting temps a little colder in winter and warmer in summer also can help. Personally, I’d want to program a t-stat before being cold! You can buy Window Film at any of the auto parts store ie, napa, discount auto, auto zone or go to a car window tinting shop and ask to purchase bigger pieces from them. They get it on a wider and longer roll.I bought mine at auto zone. Re: insulating window kits. You can purchase them at Wal-Mart. I purchased a kit for $10. “DUCK Roll-on Insulating Kit”. Kits come in different sizes, I bought the one that covers 4 LARGE windows. It’s double sided tape placed around the window, roll on plastic that is cut to fit the window. Then use a blow dryer to shrink the film. It’s sooo easy and it helps tremendously. You can not tell there is film on the window, it looks clear. Be aware there is a possibility of paint being removed from your window when you take the tape off; however, it’s cheaper to repaint than to heat the great outdoors! Re Window insulating kits – do look for them in the fall and don’t buy the pre-cut ones. You can save oodles by buying the big roll and cutting it yourself. If you run out of tape, you can buy more. However, be warned that when you peel them off, the paint will probably come away too. I used to solve this by leaving the film on most windows all year (in Summer, it keeps the heat out), but in my green retrofit I’ll be using interior storms instead. They are made of plexiglass, adhere to the window frame via a magnetic strip and you reuse them every year. This way, I will get to keep the house’s original wood windows. I live in a new condo building with sliding balcony doors. However, this winter i feel a draft coming thru. I want to be able to open the doors in the winter/summer time. What can I do to lower the wind i feel coming thru the connections ? The window film does work. I purchased mine at Home Depot, but I purchased it in the fall. They may not be stocking it now, as with most stores they also rush into the next season and probably stock patio sets and lawn items.I have also seen the kits at ACO hardware. The time to buy would be October. The window film looks like a great idea, but I second Gail’s request for help on finding it. Went to Home Depot today and the two people in the department with the regular window film (that just covers the glass) had never heard of it. What can I use to cover the whole? Where can i find the window insulation kits? We have tried Lowes and Home Depot and they don’t know what we are talking about. would think clear would be best and as silcone would be more pliable and waterproof?